On February 21, International Mother Language Day, on the occasion of the founding anniversary of the Shoily Foundation, the dhaka division volunteers arranged “Education supplies” distribution program among the unpaid school children of under privileged children. 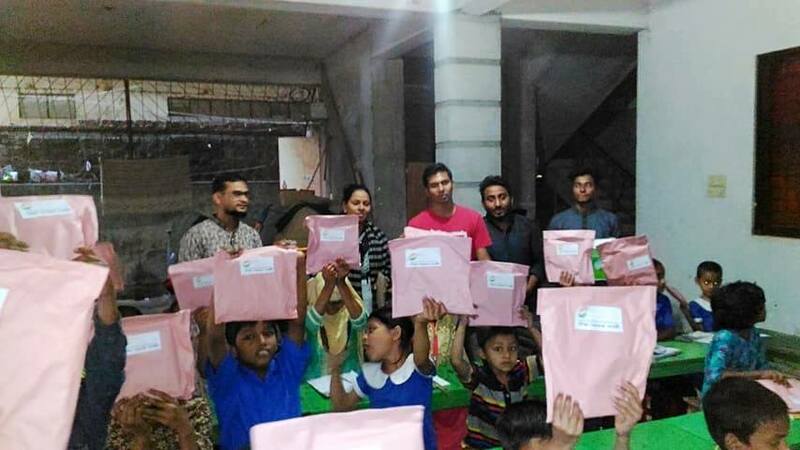 Educational aids and cash are distributed among around 50 poor students from slums around the sector 11 of Uttara sector, Dhaka. A school is operated in the open place of the house in road number 4, house No. 20, Sector number 11, Uttara. The school titled “Unmesh Pathshala” is free of cost for the underprivileged children. The Dhaka Divisional Team of the Shoily Foundation distributed books, books, pen, rubber, pencil, cutter and other essential educational materials, in collaboration with its co-ordinator Mr. Sajedur Rahman Bulbul and teacher Taslima Sahanur. Prior to the distribution of education materials, Rakib, a member of the Shoily Foundation, taught a variety of subjects related to their studies for 2-hour sessions. Shoily representative Shahinur, Suhan and Mujahudul inquired about their own family status and studies. The program was led by the Shoily correspondent and co-ordinator of the Dhaka division, Salehin Nirbhoy. 3rd grade student, “Asha” – who lives in the street selling “Pita” on the street, has to work all day in the store. She was very excited getting education materials. With these little supplies, she was thinking those will last for a long time. It is also a great pleasure to think that parents do not have to pay much attention to purchase these stuffs for these coming days. Sumon’s father is a van-driver. His father even could not able to run his van for last few days due to severe illness. So they are passing hard time to run their family. Thus, for the past few days, they are struggling with various problems. At the time of getting such education materials there are much benefited. Likewise, they have many problems in their lives. Yet they want to continue their studies smoothly. They always wait for the help of the philanthropist people, thus. Occasionally some people also arrive here to donate some food. Mr. Saidur Rahman, co-ordinator of “Unmesh Pathshala”, said that he is thinking about a uncommon arrangement – to organize a sports competition among these children with the children of the wealthy people of the society. He also sought cooperation from the Shoily Foundation for the fund. Shoily Co-ordinator, Salehin Nirbhoy promised to help them in this regards. Everyone in the Shoily Foundation wants to cooperate directly with this work. In addition to this, people from all places are invited to join this noble initiative. It is to be noted that at present, about 50 underprivileged children are getting an opportunity to get education for free of cost.